Description: Treacherous twists await Greta as the stakes get even higher in this stunning follow-up to the “masterful” (School Library Journal, starred review) novel, The Scorpion Rules. My Thoughts: This second book in the Prisoners of Peace series has Greta turned into an AI and trying to adjust the the flood of new information in her brain. She is being guided by Talis, the AI who rules the world. 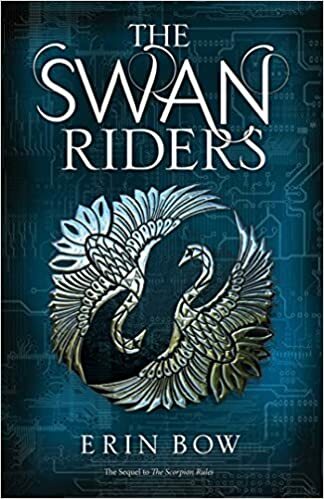 She is traveling with him and two Swan Riders to a base where she can spend time adjusting when they encounter some people who aren't happy that Greta was turned to an AI. They want to rescue her but she doesn't feel that she needs rescuing. When Talis is injured they need to move even faster to get to their base. Along the way Greta learns a lot more about the Swan Riders who she had only seen as executioners when they came to her school to kill hostages. She learns that, while most are loyal to Talis, there is a growing majority who want to change the way things are done. Over the course of the 500 years since AI took over the world and stopped the wars under threat of force, the AI have been losing touch with any shreds of humanity that remained when they were turned to AI. Greta, as the newest AI, can see this and wants to make some changes. So do the Swan Riders. This was an intriguing science fiction story with realistic characters and a great plot. I loved the world building and the descriptions of the badly damaged Earth. "Greta, dear," said Talis. "I'm five hundred years old. How do you suppose I got that way?" "Multiple copies and massive fortifications," said Sri. "My point," said Talis crisply, "is that when you're the center of the universe, it's always about you."